There is nothing quite like the exhilarating feeling of hooking into your first Mahi Mahi from the comfort of one of our modernly equipped boats whilst 25 miles off the majestic Salvadorian coast line. Our knowledgeable crew with over 20 years of combined experience will introduce you to the thrill that is fishing in El Salvador. We offer offshore and deep sea fishing excursion packages. All packages are custom made with your needs in mind. 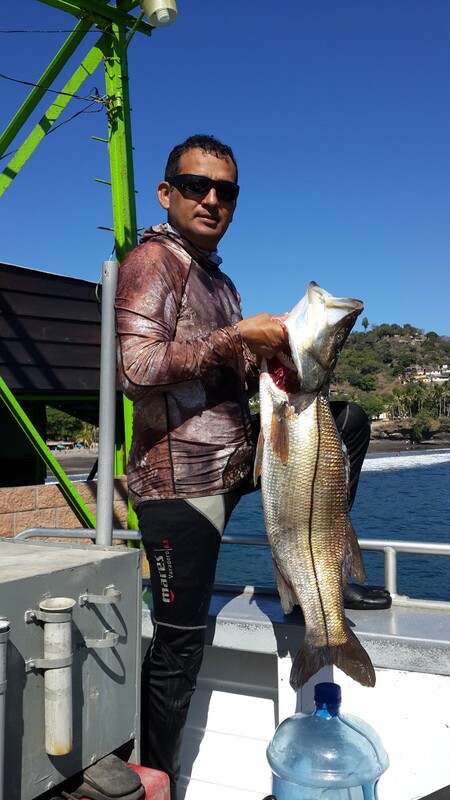 The coastal waters of El Salvador are home to some of Central Americas’ most prime fishing. A wide variety of coastal and pelagic species can be found here in our local waters. There are two seasons in El Salvador, the dry season and the wet season. Our dry season spans from November to April. Traditionally this time of year is the most favorable for deep water excursions. Blue Marlin, Sailfish, Mahi Mahi, Wahoo, Yellowfin and Skipjack Tuna are just some of the species that you may encounter on one of our exciting deep sea trips. You can normally expect spending at least 8 hours on the water while enjoying a deep water fishing trip. The wet season starts in May and will wind down by October. We host many near shore trips during this time of year. Spanish Mackerel, Barracuda, Snapper, Jacks, Rooster Fish and Snook are a sample of some of the species you may land on one of our near shore fishing trips. These trips tend to be shorter in duration. Perfect for the guest that has afternoon plans. To schedule one of our exciting fishing charters contact us today by writing to tours@bocaolas.com .